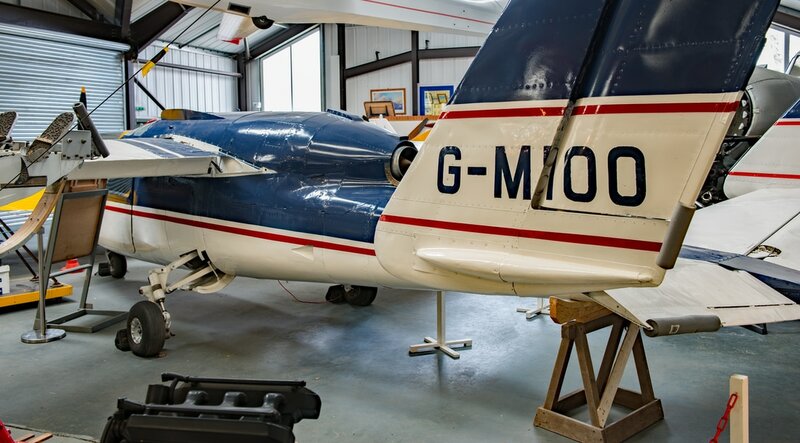 Berkshire is a county rich in aviation history and there is no better place for a museum to be placed than at the former airfield at Woodley. 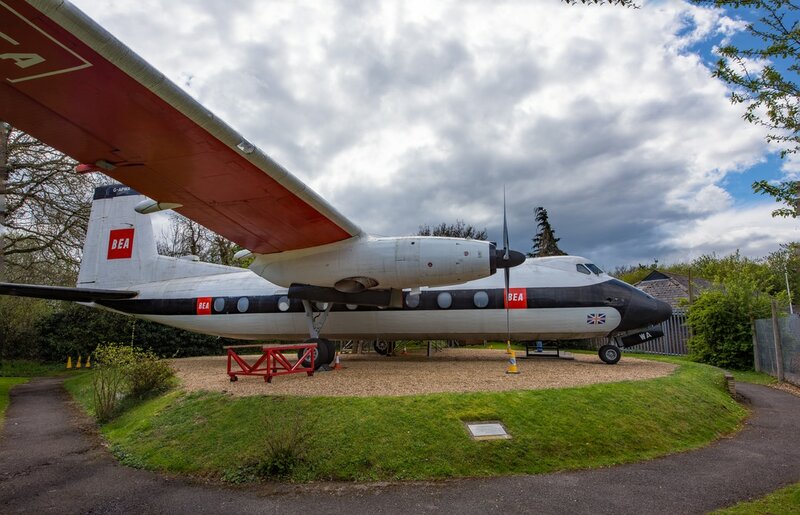 Opening on 27 March 1993 the Museum Of Berkshire Aviation was originally housed in a reconstructed Robin hangar which once served on the airfield. As the collection grew more space was required which led to an extension to the hangar being built in 2008. Woodley was once the hub of a thriving aircraft industry with Miles and Handley Page building aircraft for both military and civilian use. Fairey Aviation also had connections with Berkshire with the Gannet prototype, then known as the Fairey Type Q (VR546), first flying from Aldermaston in September 1949. Other types of aircraft such as the Fairey Jet Gyrodyne made its first tethered and free flights from White Waltham airfield in 1954. 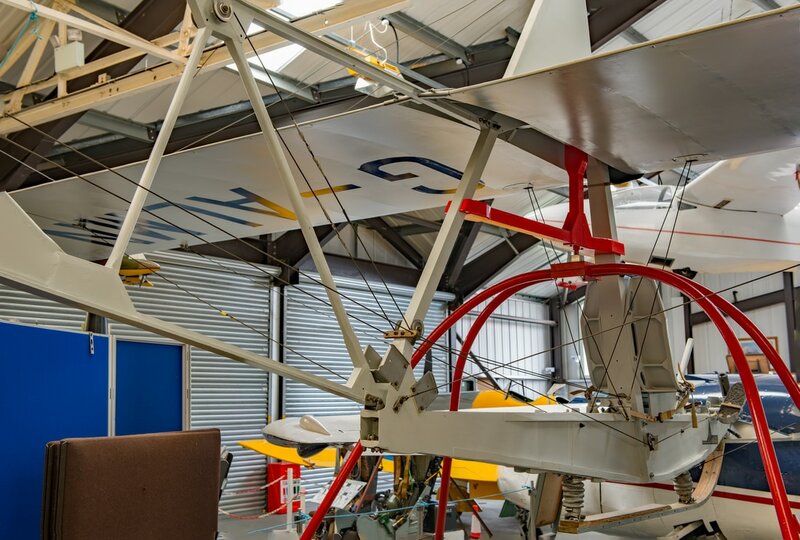 Gliders were also designed and built in Berkshire and these are represented at the museum in the form of the EoN Primary Trainer and Olympia 465 (Phase 2), both constructed by Elliotts of Newbury. 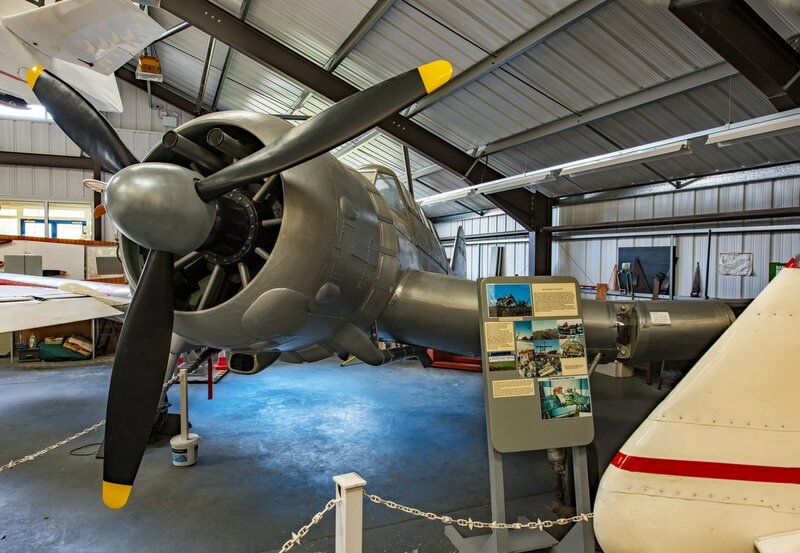 The museum as well as its aircraft exhibits holds a vast collection of historical information relating to the airfield and its aircraft industries. Constructed as a replica this aircraft was originally a Miles Magister M.14A serialled T9841. Constructed as one of the last batch of 300 Magister I airframes delivered from Woodley between May 1940 and January 1941; the aircraft was flown by No 16 Elementary Flight Training School (EFTS) and then by 11 EFTS. ​After the war the aircraft was sold to BOAC and was used by their Speedbird flying club. Flying with the registration G-AKKY it was used until withdrawn from use in November 1964. As with many withdrawn aircraft this Magister fell into disrepair with the subsequent destruction of the fuselage and centre section. The remaining components were bought by the 49 Group headed by Graham Johnson and these were used to construct L6906 between 1967 and 1979. In June 1987 the aircraft was handed over to Julian Temple Chairman of the Berkshire Aviation Group for subsequent display at the museum. 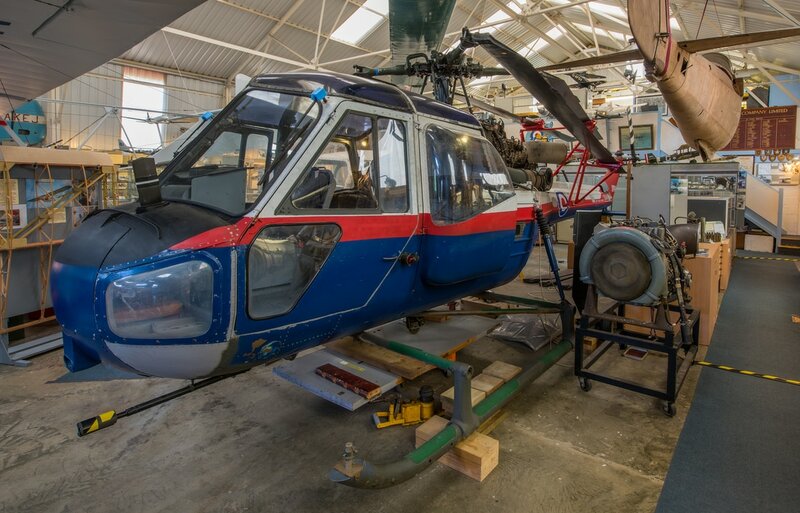 ​The principle for the original Gyrodyne was to try and combine the best attributes of an autogyro with that of a helicopter, whilst avoiding some of their respective limitations. The aim was to obtain greater operating efficiency while reducing the loads on rotor and transmission systems; which many engineers at the time considered were being severely stressed during flight. The Gyrodyne's rotor provided lift whilst the aircraft's piston engine provided thrust for forward flight. This configuration reduced loads on the rotor and transmission as it was not being used for propulsion, which meant that operation for long periods within or near the autorotative pitch range could be achieved. In September 1947 the Gyrodyne prototype G-AIKF was ready for ground running with the first untethered flight at White Waltham taking place in December. In March 1948 the Gyrodyne was dismantled for examination by which time the second prototype G-AJJP had been completed. After G-AIKF had been reassembled the aircraft was readied for an attempt on the international helicopter (Class G) speed record. At the time an unofficial speed record of 114.6 mph had been achieved by a Sikorsky R-5 helicopter in the USA. On 28 June 1948 the Gyrodyne achieved a speed of 124.3 mph, a new world record and the first British national record for a helicopter. Ten months later an attempt to set a 100 km closed circuit record ended in tragedy when on 17 April 1947 G-AIKF crashed following a rotor head failure at Ufton; killing the pilot and observer. The second prototype was grounded and four years later reappeared as the Jet Gyrodyne. 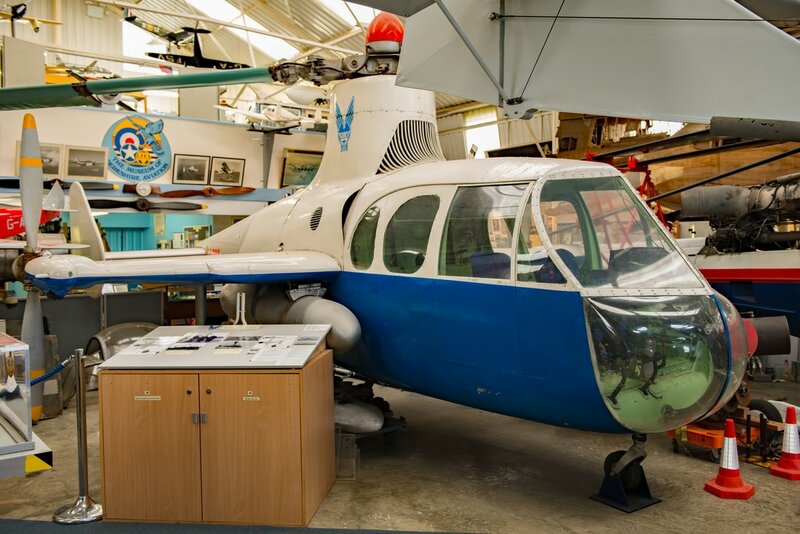 The Jet Gyrodyne located at Woodley belongs to the Royal Air Force Museum's Reserve Collection and is a conversion of Gyrodyne G-AJJP. The aircraft's initial serial number XD759 was changed to XJ389 due to duplication. At the tail end of 1953 the Jet Gyrodyne appeared following a long period of static tests at White Waltham. Powered by a Alvis Leonides nine cylinder radial engine which drove the aircraft's two pusher propellers and two Rolls Royce Merlin superchargers which delivered air to the rotor's tip jets; where in turn fuel was burnt which was supplied by centrifugal force through the rotor blades. The Jet Gyrodyne retained the fuselage, tail unit, stub wings and tricycle undercarriage of the Gyrodyne but here is where the resemblance ended. Lift for take off, slow flight and landing was provided by the jet driven rotor with transition to cruising flight being achieved by progressively reducing the compressed air to the rotor, with available engine power being transferred to the aircraft's two pusher propellers. The rotor was used as an autorotating lift unit with a very small amount of additional lift being provided by the stub wings. The procedure was reversed for a return to helicopter flight. The first free flight for the Jet Gyrodyne took place in January 1954 but full transition from helicopter to autogyro flight was not achieved until March 1955, this goes to show the difficulty of the aircraft's flight concept when put into practice. By September 1956 the Jet Gyrodyne had made a 190 transitions and 140 autorotative landings enough for techniques and procedures to become familiar and understood. The knowledge gained through the flight testing of the Jet Gyrodyne went on to be used for the development of the Fairey Rotodyne but that's another story. Woodley's Martinett is a very rare aircraft and is the only complete example in existence. Designed as a target towing aircraft the type was used during World War Two by both the RAF and the Fleet Air Arm. The need for fighter affiliation aircraft to aid Bomber Command crews in defensive tactics against fighters also saw the Martinett used in this role. MS902 was constructed at Woodley in 1943 and delivered to No 27 Maintenance Unit at Shawbury on 21 October 1943. In December 1943 the aircraft was shipped to Reykjavik in Iceland where it was assigned to the Station Flight in January 1944. Assigned briefly to No 251 Squadron on 19 July 1945 the aircraft again returned to the Station Flight at Reykjavik before being sold on 18 July 1949 to the Akueyri Flying Club with a civilian registration of TF-SHC. The aircraft came to grief with the Flying Club in July 1951 at Kopasker in North-East Iceland and the wreckage was to remain there until 1977. Salvation came when the Icelandic Aviation Historical Society saved the remains of the aircraft and moved them to Reykjavik Airport for covered storage. 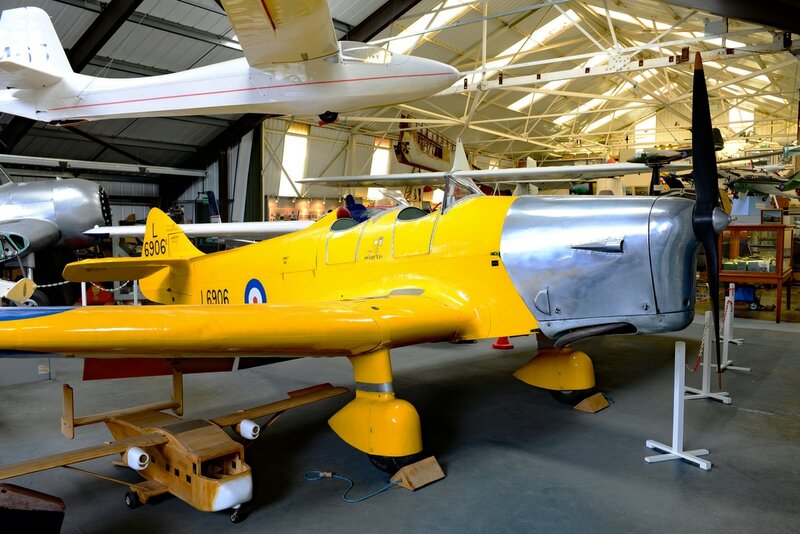 It was planned to put the Martinett on display in Iceland, however, in 1993 staff from the museum visited the country and negotiated a return for the aircraft to Woodley, which arrived back in the UK in 1996. Since then restoration work has taken place and the Martinett is now displayed at Woodley with its civilian applied and in a silver colour scheme. Manufactured and designed by Elliotts of Newbury the EoN Primary Trainer was designed to give ab-intio training to pupils such as those enlisted with the Air Cadets. A very straight forward concept which owed much to pre-war German glider design, the type was used to give pupils the chance to undertake low cost flights, often launched from hillsides by bungee cord. The Westland Scout and its Navy counterpart the Wasp were lightweight military helicopters derived from the Saro P.531. 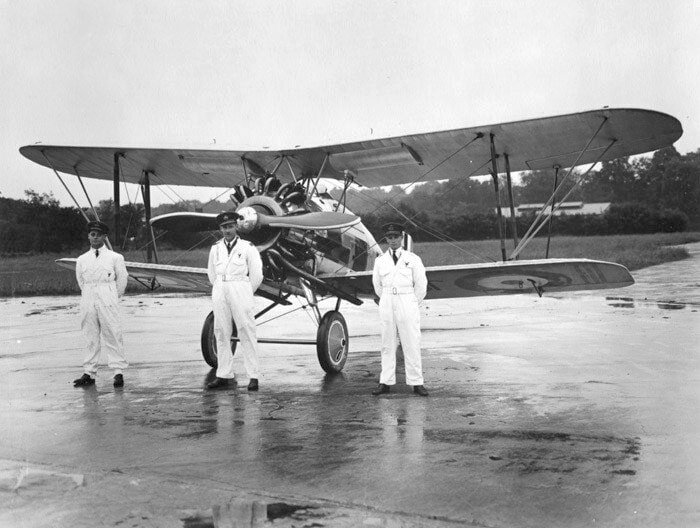 Scouts and Wasps were both test flown at White Waltham following Fairey's merger with Westlands thus securing the types connection with Berkshire. Scouts were also widely used as static instructional airframes at the Royal Electrical and Mechanical (REME) Garrison at Aborfield. Scout AH.1 XP849 was delivered to the Empire Test Pilots School at Boscombe Down on 18 December 1979 for use with the Rotary Wing Test Squadron. However, the Scout here although marked up as XP849 is in fact a composite of AH.1s XP854, XP895 & XT619. Little is known about the aircraft apart from the fact that XP695 crashed on 10 November 1966 following engine failure near Overton Hampshire, with thankfully the crew surviving. The other two Scouts were equally unlucky with XP854 crashing on 15 May 1965 with XT619 following suit on 10 March 1966. Only one Broburn Wanderlust glider was built and its place in the museum was secured due to it being designed and built by two Miles employees T.E.Brown and K.W.Bradburn, shortly after the Second World War ended. The glider is of wooden construction and has a single seat. Plans to build further examples of the type did not come to fruition and this sole example was stored at RAE Farnborough, until being donated to the museum and arriving on 28 November 1992. Envisaged as a research aircraft that could reach the then heard of speed of 1000 mph in level the flight, the Miles M.52 was cancelled by the Labour Government in February 1946. 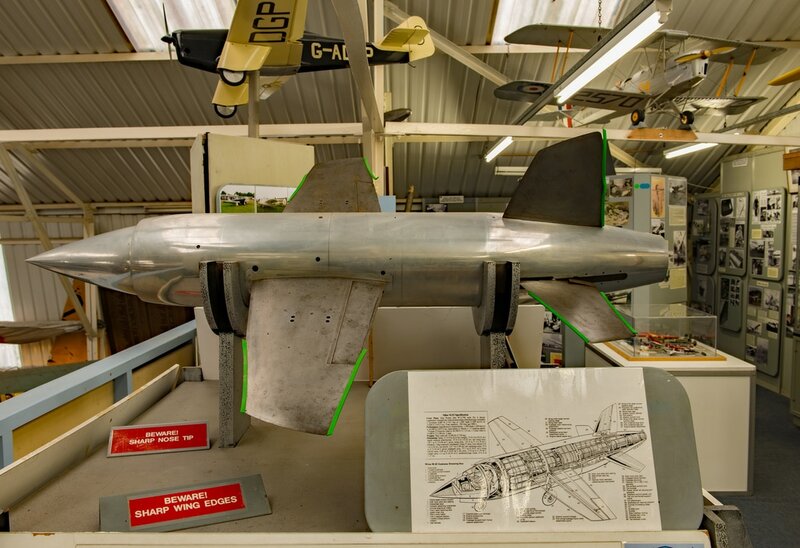 The turbojet powered aircraft never flew but scale models, dropped from a de Havilland Mosquito mothership, did and speeds of over Mach 1 were achieved. ​Design and research from the M.52 programme was shared with the USA who later went onto to break the speed of sound with their Bell X-1. No Miles M.52 exists but this example of a wind tunnel model is held by the museum as an idea of what could have been. Designed and built as a private venture by the Miles brothers, the Student was considered to be a lower cost alternative to the Jet Provost which at the time was being considered for use as the RAF's standard jet training aircraft. Delays in production saw that the Student did not fly until 1957, by which time the RAF had procured the Jet Provost. The aircraft incorporated a number of unusual design features, which had it gone into production, would have justified the claims of a more cost effective alternative to the RAF's by then in service trainer. Flying at Duxford on 24 August 1989 the Student crashed due to engine failure with a likely cause being the separation of a turbine blade. The pilot, Peter Hoare, was lucky to survive being clinically dead for twenty minutes before a successful resuscitation. The aircraft has been restored to static display standards by museum volunteers. 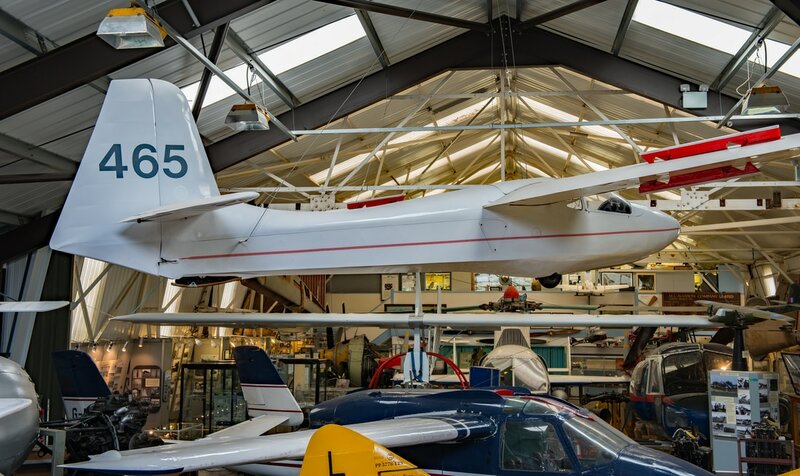 Designed and built by Elliots of Newbury, the museum's Olympia 465 glider took part in the 1965 World Gliding Championships held at RAF South Cerney, in which it was flown by Major General Anthony Deane-Drummond. Two 465s took place in the Championships but performed poorly with a ranking of 9th and 41st achieved in the Open Class. 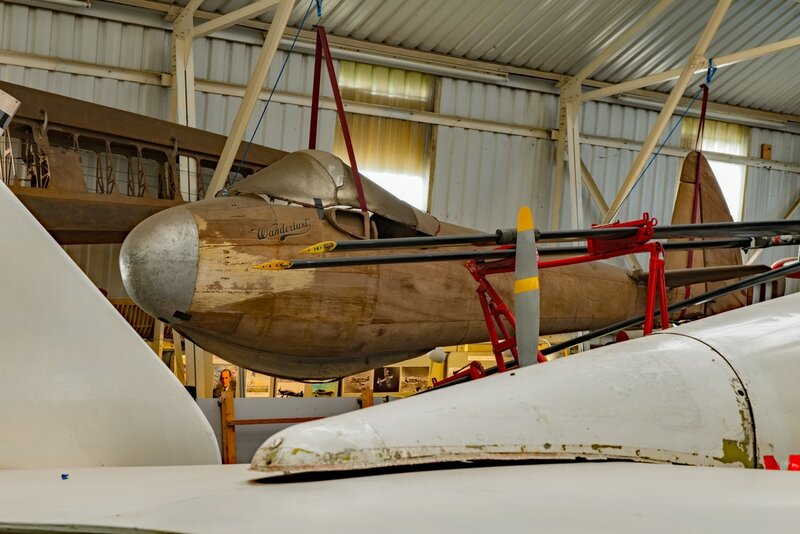 ​The glider first flew in April 1965 and arrived at the museum in May 2009. Designed to combine both search and strike roles, the Gannet was the Fleet Air Arm's first carrier borne aircraft that could do both in one airframe. The Gannet was powered by an Armstrong Siddeley Double Mamba engine coupled to two four bladed contra-rotating propellers. Consisted of two jet turbines the Double Mamba had the ability to have one engine shut down in flight, which allowed for greater endurance and loiter times. The Gannet prototype, known as the Fairey Q with the serial number VR546, first flew from the Berkshire airfield at Aldermaston on 19 September 1949. Further test flying of the prototype took place at White Waltham following a move to the airfield in November 1949. By June 1953 the first production Gannet A.S.1 WN339 was flying in the hands of test pilot Peter Twiss at RAF Northolt, with Gannets continuing to be test flown from White Waltham where fitting out of equipment was also undertaken. The aircraft was produced as the following variants, A.S.1, A.S.2, A.E.W.3, A.S.4, C.O.D.4 T.2 & T.5 . Export orders saw the aircraft equipping Royal Australian Navy, German Federal Republic's Kriegsmarine & Indonesian Naval Air Arm Squadrons. With the run down of the UK's carrier fleet the need for the Gannet diminished with the types last embarkation being onboard HMS Ark Royal, which was decommissioned in 1978. 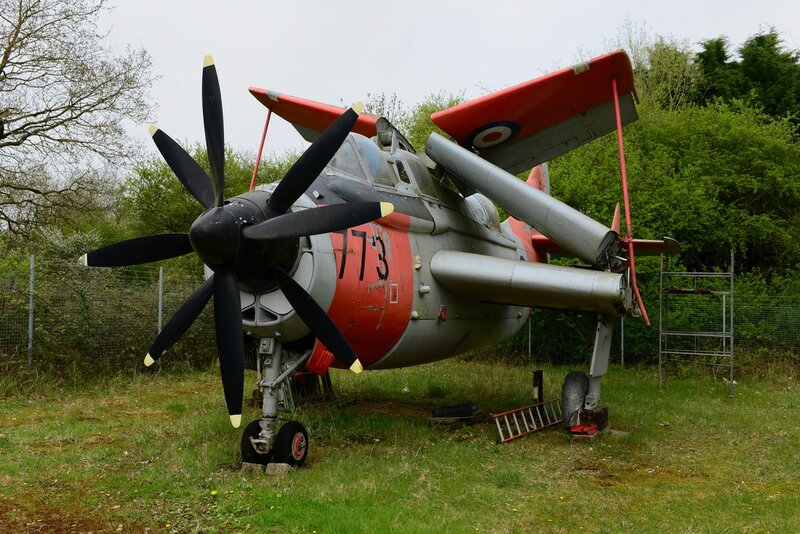 The museum's Gannet is a T.5 which is a dual control trainer variant of the type which first flew in May 1957. The aircraft was in service until January 1970 after which it was stored at various locations with the Fleet Air Arm until March 1983, when it was moved to the Wales Aircraft Museum at Cardiff Airport. In March 1996 the aircraft moved to Woodley where it is displayed with wings folded to this day. First flying from Woodley on 11 March 1958 the prototype Dart Herald G-AODE was a short range regional airliner which was manufactured by Handley Page (Reading). The museum's example is the first production Dart Herald and first flew on 30 October 1959. By the end of production in 1965, forty three Dart Heralds had been constructed with the type remaining in passenger service until 1987 and as a freight carrying aircraft until 1999. On 14 December 1931 a man who was to become a legend in World War Two flew into Woodley in Bristol Bulldog MKIIa K1676 to visit Reading Aero Club. Douglas Bader was at the time flying with No 23 Squadron and was known to be a little headstrong when it came to aerobatics and taking risks. After lunch at the club someone dared Bader to carry out low level aerobatics to which he declined. The comment was made about being "windy" which was too much for Bader to take and he duly took off. Rolling the Bulldog at low level a wing tip hit the ground and the aeroplane was reduced to a ball of scrap metal. Bader was badly injured and he subsequently hovered between life and death, losing both legs as a result of the crash. He did however, survive and went on to fly again with tin legs, rejoining the RAF in World War Two. In circumstances still debated as to what actually happened, Bader came down in France on 9 August 1941, when his Spitfire MKVa W3185 was either shot down or collided with when in combat amidst Luftwaffe ME Bf109s. ​Bader became a POW and was a constant thorn in the side of his German captors. He undertook or attempted numerous escapes from his POW camps which in the end resulted in him being interred in the infamous Colditz Castle, where he remained until the War's end.